Nonsuch Park, situated between Cheam and Ewell in a large residential area of London, was historically an estate of Henry VIII. Earlier this month it received an advisory visit under the B&Q Good Woods project, to help secure its future in the 21st Century and beyond. Owned by Surrey County Council and leased to Epsom & Ewell Borough Council and the London Borough of Sutton, the park is managed through a joint management committee comprising the Councillors from both boroughs and, in an advisory capacity, by a number of local stakeholder groups. 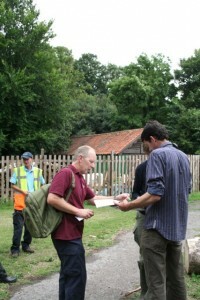 One of the strategic aims of the Nonsuch Park management team was to establish a volunteer group. In 2011, Nonsuch Voles was established as a voluntary association, with the four founding members forming the group’s committee. Today there are nine members, although the number fluctuates as people join the group and others move on. The group meets two days a week. Activities currently include woodland management, woodland craft, firewood production in the woodlands and gardening maintenance, pruning and planting in the formal gardens. 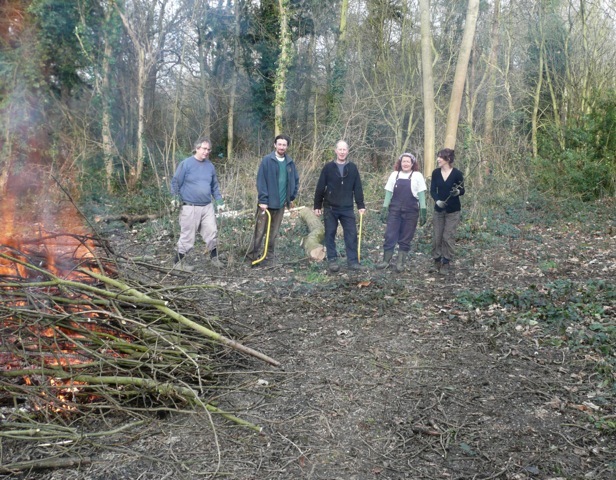 The vision for the woodland at Nonsuch is to “bring the woodland to life, making it accessible and sustainable”. With this in mind, the aim has been to increase levels of woodland stewardship at Nonsuch, re-introducing sustainable woodland practices. Activities to date have included undertaking thinning and coppicing activities for two woodland parcels over the last two autumns/winters. Over 1,000 Hazel saplings have been planted in these areas to provide future coppice produce. Future activities include completing the woodland management plan and working on thinning, coppicing and planting over other areas in the woodland. In order to monitor the impact of re-introducing management activities in the Nonsuch woodlands, ground flora and butterfly surveys were undertaken prior to any work starting in the area. Annual surveys and photographic records have demonstrated a significant increase in the number of species of ground flora and butterflies following the coppicing work. John Armitage, a resident independent coppice worker, manages the wood yard and provides overall co-ordination of the woodland activities, in line with a management plan to be developed with the Forestry Commission. The Nonsuch Park joint management committee provides a good example of multiple stakeholders groups working together to achieve a mutual vision. As well as councillors and staff from the two councils, the group includes three voluntary interest groups including the Nonsuch Voles. Helping spread the word about the group’s woodland activities and connecting the group with other groups and experts involved in woodland management. The Nonsuch Voles are always interested in hearing from anyone with a keen interest in woodland management or gardening at Nonsuch Park, and who can spare a few hours to help with the group’s tasks. Information can be found at www.nonsuchvoles.org.uk, by emailing nonsuchvoles@gmail.com or by going to the group’s Facebook page.